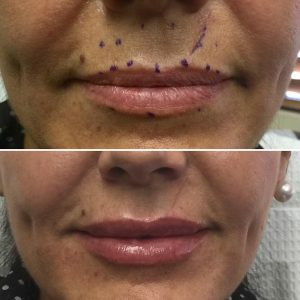 Naturally small or aging lips can benefit from a variety of injectable cosmetic fillers to enhance contours and create a more youthful appearance; however, advancements in dermal filler technology have created a new product in the JUVÉDERM® family that is developed especially for these applications: JUVÉDERM VOLBELLA XC. JUVÉDERM VOLBELLA® XC is an FDA-approved smooth gel, hyaluronic-acid dermal filler designed to add volume to thin lips and treat signs of aging along the lips and around the mouth. To help prevent discomfort during the injection process, this product is formulated with lidocaine—a local anesthetic. JUVÉDERM VOLBELLA® XC has been proven to achieve remarkable results that can remain for up to one year or more. Plastic surgeon Christine Petti, MD has incorporated FDA-approved JUVÉDERM VOLBELLA® XC into her offering of injectable treatments and often combines this product with BOTOX® Cosmetic and other dermal fillers to achieve comprehensive facial rejuvenation. What Are the Benefits of JUVÉDERM VOLBELLA® XC? As we grow older, the lips can begin to lose volume and suppleness, and vertical lines can form on the skin around the lips (called perioral rhytids). The hyaluronic acid-based formula of JUVÉDERM VOLBELLA® XC is designed to combat these changes by bonding with moisture molecules beneath the skin to plump the area, add definition, and reduce the appearance of wrinkles. Patients with naturally thin lips can also benefit from the smooth, long-lasting JUVÉDERM VOLBELLA® XC formula. Dr. Petti often recommends JUVÉDERM VOLBELLA® XC for patients who desire lip augmentation results that balance their facial features and do not look overly “done”. Since hyaluronic acid is a substance found naturally within the body, no allergy testing is required before treatment. JUVÉDERM VOLBELLA® XC is a next generation hyaluronic acid dermal filler uniquely formulated to smooth fine lines around the mouth and add soft, subtle volume to the lips. Another product, JUVÉDERM® VOLLURE, is in the same filler family; however, this injectable is specifically used to treat the appearance of moderate to severe facial wrinkles and folds. Most commonly, JUVÉDERM® VOLLURE is injected to smooth the appearance of nasolabial folds that extend along both sides of the nose and around the corners of the mouth. What Happens During the JUVÉDERM VOLBELLA® XC Procedure? During your consultation, Dr. Petti will carefully listen to your cosmetic concerns and help ensure that JUVÉDERM VOLBELLA® XC is the right dermal filler for achieving your aesthetic goals. Before treatment, the area will be numbed with a topical anesthetic to alleviate potential discomfort during injection. Next, JUVÉDERM VOLBELLA® XC is carefully administered with a very fine needle to the designated treatment areas. Since the product’s formula contains lidocaine, patients typically report little, if any, discomfort during the procedure. 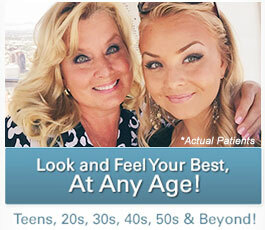 Dr. Petti can usually complete treatment with JUVÉDERM VOLBELLA® XC in 30 minutes. Many patients have the procedure performed during a lunch break or between errands and return to their daily activities immediately. Are There Any JUVÉDERM VOLBELLA® XC Side Effects? Once treatment with JUVÉDERM VOLBELLA® XC is complete, it is not unusual for patients to experience mild swelling, redness, or bruising at the injection sites. These temporary symptoms typically dissipate within a few days or less; however, in some cases, side effects may last up to two weeks until they are completely gone. Problematic side effects are highly unlikely, and the majority of our patients agree that the minor post-treatment symptoms they may experience are worth the beautiful, long-lasting final results they achieve. Patients who experience any type of adverse reaction are always encouraged to contact our practice as soon as possible. How Long Do JUVÉDERM VOLBELLA® XC Results Last? The plumping effects of JUVÉDERM VOLBELLA® XC can be seen immediately, and results typically last for up to one year or more. The secret to JUVÉDERM VOLBELLA® XC’s long-lasting, natural-looking results is the type of hyaluronic acid molecules Allergan® uses and the proprietary crosslinking technology that binds these molecules together. To maintain fuller, smoother, more youthful lips with JUVÉDERM VOLBELLA® XC, patients can schedule follow-up treatments with Dr. Petti as needed. How Much Does JUVÉDERM VOLBELLA® XC Cost? Like many dermal fillers, the cost of treatment with JUVÉDERM VOLBELLA® XC is based on the volume of the product that is injected to complete your enhancement. Since JUVÉDERM VOLBELLA® XC injections are customized to meet the unique needs and goals of each patient, the amount of the product used can vary greatly. During a personal consultation, Dr. Petti can determine the quantity of JUVÉDERM VOLBELLA® XC injections you will likely need and provide a close estimate of the overall expense of treatment. At our award-winning medical day spa, Spa Bella, we offer seasonal specials that often include JUVÉDERM products, which can reduce the overall price of your treatment. 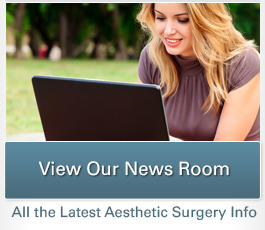 For patients interested in plastic surgery financing options that can make paying for treatment more affordable and convenient, we also partner with third-party lenders that offer loans and payment plans to qualified applicants. The online approval process is quick and easy, and our knowledgeable team members can answer any questions you may have. To learn more about JUVÉDERM VOLBELLA® XC and the wide range of dermal fillers we offer at Spa Bella, please contact our office today to schedule a consultation with Dr. Petti. Your personal consultation can provide you with a customized non-surgical treatment plan for improving your appearance, in addition to an accurate cost quote.